Residents in Ladybrook are being invited to a community litter pick which aims to tidy up their estate. Organised by All Rise Community Group, the litter pick will coincide with the Great British Spring Clean and encourages residents to join in and clear up their streets. Residents will meet up at Brookside Hall, on Ladybrook Lane, from 11am on Saturday, April 6, and will work together to pick up litter and improve the image of the estate. Anthony Wharmby, who organises the group, previously said: "It is important for us to get out and clean up the streets because its getting really bad. "The amount of litter is disgusting and we need to take a stand." The event was organised in partnership with the office for Mansfield MP Ben Bradley, with a representative attending an All Rise meeting in February and agreeing to sponsor a poster to promote the event. 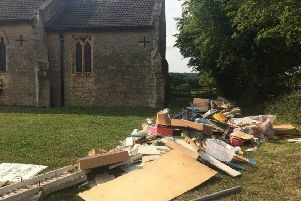 A spokesman for the MP said: "Ever thought of getting together with your neighbours, friends and family to do a community litter pick? "Come along to the litter-picking session in Ladybrook as part of the Great British Spring Clean 2019 - Keep Britain Tidy. "Litter pickers, jackets, equipment and refreshments will be provided."